Roast chicken pieces, cooked brown rice and quinoa, egg, broccoli, a mix of salad leaves, red peppers, yellow peppers, cashew nuts, almonds and a pot of vinaigrette dressing. Tender Chicken Breast Leaves topped with egg, peppers, quinoa, brown rice, and a vinaigrette Our chefs have developed recipes using carefully selected ingredients to create vibrant salads which are full of flavour. 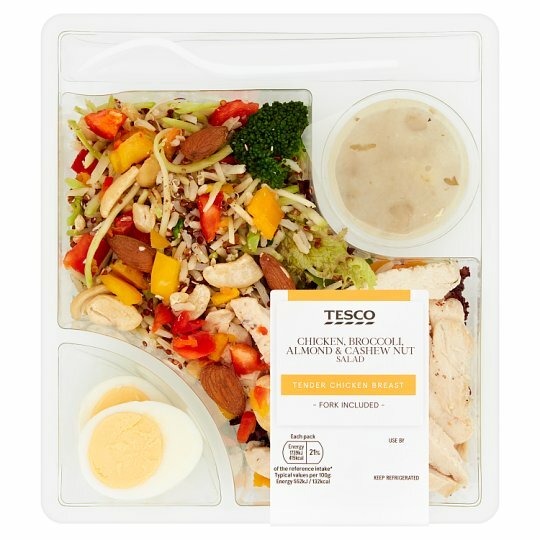 INGREDIENTS: Chicken Breast (21%), Cooked Brown Rice [Brown Rice, Water], Egg, Vinaigrette Dressing, Broccoli Stalks (7%), Cooked Red Quinoa [Water, Red Quinoa], Broccoli Florets (4.5%), Red Pepper, Yellow Pepper, Red Multileaf Lettuce, Apollo Lettuce, Cashew Nut (2%), Almonds (2%), Maize Starch, Salt, Acidity Regulators (Citric Acid, Trisodium Citrate), Black Pepper, Garlic Powder, Sunflower Oil. Vinaigrette Dressing contains: Water, Cider Vinegar, Sugar, Rapeseed Oil, Cornflour, Salt, Concentrated Lemon Juice, Garlic Purée, Parsley, Chive, Mustard Flour, Black Pepper, Onion Powder, Wheat Flour [Wheat Flour, Calcium Carbonate, Iron, Niacin, Thiamin], Acidity Regulator (Citric Acid), Turmeric.